This is a formal comment from the Stevens County Cattlemen’s Association to again record our strong opposition to any reintroduction or “recovery” of grizzly bears into the North Cascades. A deliberate, artificial introduction or encouragement of this species in Washington State will cause untold economic and social damages in areas that are not suited to the proliferation of this large, dangerous predator. In addition to having serious impacts to farms, ranches and orchards in the North Cascades, grizzlies also pose serious risks for recreationalists as the bears can be very aggressive and can easily harm or maim human beings. In 2013 alone, 7 people were attacked by grizzlies, including a hunter in Alaska, two habitat researchers in Idaho and hikers in Yellowstone National Park. In 2011, two hikers were killed in two separate grizzly bear attacks in Yellowstone, exactly in the area where grizzly bear “recovery” is being promoted. There are at least 593 grizzlies in the greater Yellowstone area in the northwest corner of Wyoming. Grizzlies are also thriving in nearby Montana where approximately 1,000 grizzlies live on the 8 million acres of the Northern Continental Divide Ecosystem that encompasses western Montana and Glacier National Park. The number of bears in that area now makes the grizzlies candidates for removal from the federal Endangered Species list. The bears were originally listed in that area as “endangered” not due to an actual decrease of the species but for “lack of biological information on its status and habitat requirements,” according to Montana Fish and Parks. Closer to home, in Idaho, the US Fish and Wildlife Service (USFWS) declined to upgrade protections in 2014 for grizzlies in Idaho and Northwest Montana, noting that the population is considered “stable.” Populations in the Selkirk Mountains will also not receive special protections from USFWS, with nearly 90 bears in the population. In addition to high numbers in Yellowstone and Montana and a stable number of grizzlies in Idaho, the total number of grizzlies worldwide is estimated to be above 200,000. This animal is not endangered. In addition to the questionable statistics regarding the grizzlies’ endangered status, there is also the issue of forcing a population in an unsuitable area. In Montana, where grizzlies have proliferated to the point of attacking people and livestock, there are only 6.8 people per square mile. In Washington State, there is an average of 101.2 people per square mile. This difference in density is incredibly important to consider, as the potential for grizzly-human conflict, grizzly encroachment near homes, into livestock paddocks and other places of human occupation is incredibly high. Stevens County Cattlemen’s Association is categorically opposed to any efforts by the National Parks Service to “recover” a grizzly population in the North Cascades due to the fact the bear is not actually endangered globally or in the West; the fact that grizzlies pose serious safety considerations for residents and visitors to the North Cascades and that the economic detriment that will be caused to farms, ranches and orchards far outweighs any “grizzly experiences” for tourists. SCCA Banquet coming up soon! We are writing to OPPOSE any increase to the Washington State Beef Checkoff Assessment and strongly urge you not to support a bill that would increase the tax burden on our ranch families. The current $1.50 per head Beef Checkoff fee for cattle sold in Washington is not actually helping Washington State ranch families, as the marketing dollars do not specifically highlight or promote their product—beef raised in the U.S. and in the great state of Washington. A generic “beef” campaign is being used by the Washington Beef Commission which fails to alert consumers to the very real differences in quality between U.S. raised beef and beef from countries like Canada, Mexico, Australia and many countries in Latin America. To fail to recognize the higher standards achieved in the U.S. is to deceive the consumer and the only real beneficiary of the campaign is the end salesman—the multi-national meat companies like Tyson who would prefer the consumer never be able to tell the difference. As the numbers of ranchers is continuing to decline in Washington, the WA Beef Commission does not seem to find a problem with taking their ineffective, generic marketing campaign back to ranch families and asking them to pay more for a program that is not working for them. The Beef Checkoff program has not kept Washington’s ranchers in business, as recent research indicates. According to recent data from the U.S. Department of Agriculture, there are less than 10 ranchers left in the state of Washington with more than 1,000 head of cattle and there were less than 200 operations left with enough cattle to be considered a full-time enterprise. In fact, the number of ranchers in our state has dropped by 52 percent since 1984. Those who survived have experienced a severe drop in live cattle prices in the last two years, dropping from a high of nearly $3.00 a pound in calf prices down to just over $1.00 a pound this fall. The Washington State Beef Commission should take a great interest in recognizing the negative long-term trends that threaten the survival of the cattle industry in Washington State, including subsidized imports, and actively work to promote the product of the U.S. cattleman over all others. If the commission fails to make this very important reform, the program should be abolished and we are confident that Tyson and other large meat retailers will find a way to market their own product. 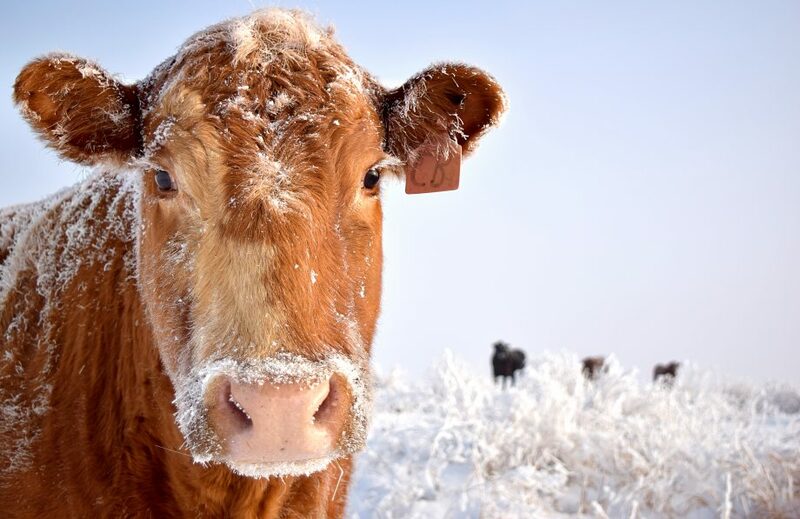 Stevens County Cattlemen’s Association DOES NOT support and increase to the Beef Checkoff at this time and seriously recommends the program be scrutinized not for its ability to sell “beef” but to act as an effective marketing campaign for the people paying the bill: the U.S. rancher. This photo was featured in a recent edition of the Ferry County View and shows a calf from the K Diamond K ranch who was likely attacked by a wolf. The Washington Department of Fish and Wildlife has begun efforts to remove wolves from the Profanity Peak wolf pack after a fourth calf was confirmed by the department as a wolf kill last week. The Profanity Peak wolf pack, which numbers at least 11 total wolves including pups, has killed five calves and the pack was deemed a “probable” cause in the death of three more calves. In total, at least five cattle have been killed by the pack within the last 30 days. The dead cattle have been found northeast of Republic and belong to two different ranches. Now that WDFW has committed to addressing the problem, Stevens County Cattlemen’s Association President Justin Hedrick said WDFW should commit to full removal. The Profanity Peak wolf pack has been killing cattle for the last three years. In 2014, the Ferry County Commissioners declared a state of emergency and called for pack removal by WDFW, but they were ignored. Since then, a Wolf Advisory Group formed by the department has developed specific protocols with WDFW on when wolves should be removed. Precursors to wolf removal, according to the WAG checklist, include four WDFW confirmed kills by wolves within a calendar year and an attempt to use non-lethal methods to stop the killing. Although the Diamond M and another affected ranch tried additional non-lethal deterrents like range riders, removing carcasses of killed cattle and other methods, the Profanity Pack has not stopped preying on cattle. Hedrick said SCCA expects WDFW to follow through on their commitment to remove wolves until the job is done. The Profanity wolf pack, located in northeast Ferry County, has again started their killing spree, killing three calves within the last 10 days. The pack that numbers at least seven adult wolves, a breeding pair and likely a new litter of pups is again taking advantage of the rugged territory near Sherman Pass to kill cattle that are out on summer range. The three calves killed belong to the Diamond M Ranch that has had previous “confirmed” killings by the Profanity Pack in 2014. The Washington Department of Fish and Wildlife confirmed that the ranch lost a cow-calf pair and a calf to the Profanity wolves in 2014, however, the actual losses were much higher. The 2014 losses and the addition of at least three more killed calves this year is a significant loss to the ranch, with each loss calf costing at least $1,500 in potential revenue. The persistent attacks from the Profanity Pack are making for a reoccurring nightmare for the Diamond M that saw this kind of behavior explode into a crisis situation in 2012. Wolf activity from the Wedge Pack in 2012 culminated into 17 wolf attacks and the ranch absorbing over $100,000 in losses due to the Wedge Pack activity. Eventually, some of the Wedge pack was removed by WDFW, but as the losses were mounting in the summer of 2012, WDFW did nothing but mark down the body count. While the Diamond M is trying to work with WDFW and local officials to address the situation, Hedrick said experience has shown that the only way to stop the carnage is to remove the offending wolves. “This is a chronically depredating pack that needs to be removed,” said Hedrick. Yet, at the time when the ranch needs help, WDFW has tightened up restrictions on lethally removing wolves. A lethal removal plan passed by the Wolf Advisory Group in May requires the ranch to implement sanitation measures as well as using a “non-lethal deterrent” approved by WDFW. In addition, lethal removal protocols also require 4 confirmed kills in one calendar year by the pack; non-lethal deterrents have to fail and the public has to be notified that the wolves will be removed. With only one of the three calves killed by the Profanity Pack this year being “confirmed” kills, Hedrick said WDFW is working to avoid reaching the 4 killings needed to start lethal removal. “This situation needs to be addressed because if it isn’t, we are going to see as many losses as we did in 2012 from the Wedge Pack. That is rugged country and the wolves are going to just keep killing,” Hedrick related. The 2015 wolf count from the Washington Department of Fish and Wildlife (WDFW) is no cause for celebration, as more wolves have only resulted in more dead livestock and harassed pets, according to the Stevens County Cattlemen’s Association. WDFW reported that Washington’s wolf population grew by 32 percent in 2015, with 90 wolves counted, 18 packs officially recognized and eight breeding pairs per WDFW estimates. As the official wolf numbers have increased, SCCA said WDFW has grown more and more inactive in dealing with the associated problems and losses. SCCA advocates the lack of lethal removal of problem wolves have only emboldened wolves in Eastern Washington who do not react or run away when they are seen by people. Even more alarmingly, wolves are also encroaching on residential areas and threatening pets. Two recent incidents involving wolves harassing and attacking dogs near Chewelah show how wolves will continue to be emboldened by passive deterrents. In the last two years, the Dashiell ranch near Hunters not only suffered the loss of over 300 sheep, but they were also driven off their private grazing range and had a guard dog mauled. The Dashiell ranch was forced to sell over 500 of their sheep herd, a forced move that will take over $100,000 out of the Stevens County economy. In 2015, a rancher near Chewelah also lost several cattle and the Smackout Pack, a pack that has had several years of range riders and non-lethal deterrents, attacked a calf last fall. A new plan for the Colville National Forest that will set policy for at least the next 10-15 years has layers of regulations that will force ranchers off the 1.1 million acres of public land, according to the Stevens County Cattlemen’s Association. The Colville National Forest Plan Draft, released in late February, puts forth requirements for the 58 grazing allotments that will be impossible for ranchers to meet, according to SCCA. The association notes that the plan is full of arbitrary rules that will make it difficult, if not considerably confusing, for ranchers to manage their grazing allotments per USFS requirements. In regards to grazing, the draft CNF forest plan prevents ranchers from having water developments or salting near “endangered or sensitive plant species” areas, requires grazing managers to “maintain conditions for snowshoe hairs in lynx habitat areas”, requires ranchers to “prevent livestock access to fish redds” and a number of unrealistic standards for riparian areas. “Our members strive to be good and conscientious stewards of these grazing lands that they use on a seasonal basis. The expectations in the forest plan are not only unnecessary, but they are unrealistic and taken altogether will mean the end of grazing on the Colville National Forest,” said SCCA President Justin Hedrick. In addition, grazing will not be possible on the over 69,000 acres of proposed Wilderness in the plan. Since Wilderness requires “little evidence of human developments” like stock tanks, corrals or fences and prohibits motorized vehicles like trucks or chainsaws, modern cattle management would be impossible. The current CNF plan that would kill grazing by rules and regulations would be a serious blow to the local community. SCCA notes that public land grazing is not only a beneficial practice in its ability to reduce fuel loads for wildfires, but it is also a necessary part of the local economy. Hedrick said SCCA will be asking CNF planners to revisit the grazing section and make some key changes. The Stevens County Cattlemen’s Association is urging people to sign a petition asking President Obama to pardon two Oregon ranchers who were re-sentenced to five years in federal prison for accidentally burning federal land. The petition at https://petitions.whitehouse.gov/petition/commute-sentences-dwight-lincoln-hammond-jr-and-steven-dwight-hammond-both-harney-county-oregon must gain 100,000 signatures by the end of January in order to be considered by President Obama. The petition currently has over 11,000 signatures. Oregon ranchers Dwight and Steven Hammond were recently re-sentenced to additional jail time in a federal prison after fires on their private land accidentally spread to Bureau of Land Management land near the Malheur Wildlife Refuge. Dwight,73, and Steven Hammond, 46, had already served three month and one-year prison terms, respectively, as well as paying a fine to BLM. However, a federal prosecutor had them re-sentenced under the 1996 Antiterrorism and Effective Death Penalty Act that requires a mandatory 5 years in prison for anyone who “maliciously damages or destroys, or attempts to damage or destroy, by means of fire or an explosive,” any federal property. SCCA supports responsible management of all public lands and a multi-use approach that includes logging and grazing.